The new Classic Industries truck catalog has been extensively reconfigured to offer more than 600 pages of parts and accessories for Chevrolet and GMC trucks from 1947 to 2008. The new layout organizes body components by vehicle generation with related truck restoration parts grouped together conveniently to make finding products a very simple process. Once again, Classic Industries sets a new standard in restoration. 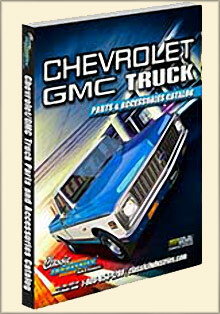 Enter the Promo Code - C73TK - at checkout on the GMC Truck Parts from Classic Industries. Truck restoration parts - When it comes to classic truck parts online, Classic Industries serves up a superior selection of Chevy and GMC truck restoration parts from emblems and decals to ignition system parts, AC and heater components, truck interior parts and exterior trim, brake parts, cooling systems, wheels, tires, truck performance parts and an A to Z collection of basic parts that will handle any Chevy or GMC truck restoration. Truck interior parts - Refurbish the inside of your Chevy or GMC truck interior with both hard and soft truck restoration parts from steering wheels, consoles and their corresponding installation parts to door components, panels and moldings, seats, universal seat belts and hardware, carpeting and upholstery, interior mirror parts, truck lock cylinders, keys and hundreds of other truck interior parts in stock that will add value to your classic GMC vehicle. Truck performance parts - Improve every aspect of your truck’s performance with GMC and Chevy parts delivered to your door. Order by catalog or shop for your truck parts online featuring everything from brake parts, transmission, steering and suspension to engine, exhaust and an impressive assortment of performance parts that will bring new life to your classic truck. Truck brake parts - While working on any truck restoration, it’s imperative to have all of your brake system components in check. Classic Industries carries a complete selection of GMC truck brake parts for your restoration including chemicals, hardware, brake lines and hoses, brake pads, drums, motors and valves, master cylinders, brake pedal components and more brake accessories and truck replacement parts that will ensure a safe ride. Chevy/GMC Truck Parts from Classic Industries fully equips both classic and newer model truck owners with a monster garage full of truck restoration parts that can handle any overhaul, large or small. From specialty truck brake parts and truck interior parts to performance parts and exterior trims, you’ll always find the part you need in house and ready to ship at Classic Industries.